My art is rooted in the craft of needlepoint but takes its visual cues from contemporary abstract art. 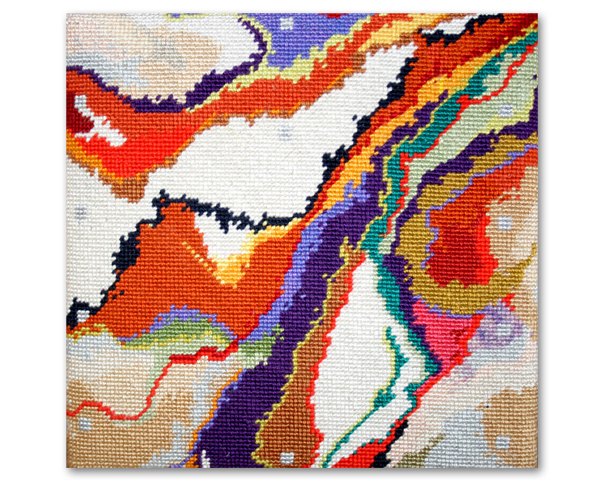 My finished canvases provide an unexpected tactile experience which cannot be duplicated by always executing “perfect” needlepoint stitches – so organic bumps and lumps are most often welcomed. As I sit with a rolled up canvas in my hands, I daydream to the steady in-and-out rhythm of my needle – looking forward to the journey that will take many thousands of stitches before it’s done. And when I look up I’m often surprised by the road that my stitches have taken – almost as if they had their own direction to take and didn’t really need me to get them there. The wild motion of my pieces expresses my fierce need for freedom. The structure of the geometric elements keeps me, and my art, grounded. All of my pieces are personalized with my own hand painted threads. I think of each finished piece of art as a short story: small in size, but telling a complete narrative. I hope that when you view my pieces that you’ll find your connection to them and then make up stories of your own.